Often times in the process of repairing centrifugal pumping equipment it is determined that the cost to repair major components approaches the cost of retro-fitting the pump with new components. Specifically, with regard to the repair of vertical turbine pump bowl assemblies in standard materials of construction. 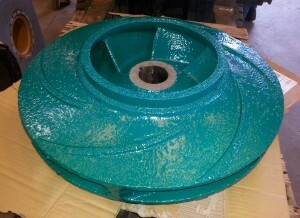 It is part of our repair cost evaluation process to compare the cost of repair to the cost of a new pump bowl assembly. With our in house fabrication and machine shops we can easily made any reasonable adaption of the new pump bowl assembly to the balance of the existing pump parts. In most cases we are able to duplicate existing pump performance or if desired modify pump performance to fit changing needs. As plant conditions or pump requirements change it is sometimes necessary to modify the physical configuration of the pump and/or its mounting. With our in-house mechanical, machine and fabrication shops Nickerson Company can often times lengthen or shorten pumps as well as alter the configuration or orientation of pump suction or discharge connections. Another common finding in the process of evaluations and repair of pumping equipment is to find that certain key components are the root cause of pump failure. More often than not it is possible to modify and/or upgrade the materials of construction of the failed components or add protective coatings and make significant gains in both reliability and run times. On deep well pump bowls we offer heavy duty material upgrade packages specifically engineered to help the pump withstand the effects of pumping abrasive and/or corrosive materials.